This boho retreat is located in Bay Head, New Jersey, a small town about an hour outside of New York City. The clients are Scott Belair, who is the co-founder of Urban Outfitters and Anthropologie, and his wife, Bayne. The design was done by Colleen Bashaw. Some of my favorite rooms from this project include the Living Room, Powder Room, their daughters' bedroom, and the Guest Bathroom. But really that Powder Room is what caught my attention. I love a bold room that expands my creativity. Powder Room's have become my favorite space in a home to design. 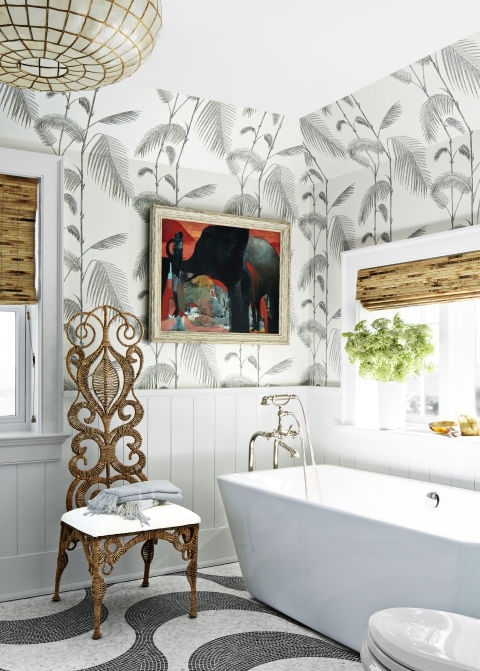 This is where many clients get a little more adventurous with wallpaper and darker features. The wallpaper is by Brett Designs. The mirror was a piece found at Anthropologie (although the designer was very conscious not to use many pieces from their company- how could you resist this piece! ), the fixtures are from Waterstone, and the countertop and backsplash are a black granite from Stone Surfaces.